For over 30 years the contact lens industry sought soft contact lenses suitable for safe, long term continuous wearing. This goal had been driven by consumer needs for convenience and safety in vision correction. In 1991, CSIRO along with the University of New South Wales, through the Cooperative Research Centre for Eye Research and Technology, joined with CIBA Vision (USA) and Novartis (Switzerland) to form an international collaboration to develop materials and associated intellectual property for successful extended wear soft contact lenses. The research, led in CSIRO by Gordon Meijs and Hans Griesser, resulted in the development of CIBA Vision’s Focus Night & Day® (FND) lenses. These lenses, made from a silicone hydrogel called Lotrafilcon A, are suitable for safe continuous 30 day and night wear. Many patients and contact lens practitioners said they would like a lens which had the oxygen permeability of the FND product but which could be worn on a more flexible basis (daily wear, occasional overnight use). CIBA Vision and the Vision CRC drew on CSIRO’s surface chemistry and characterisation expertise to develop a new silicone hydrogel material, Lotrafilcon B, from which the recently released O2OPTIX® lenses are constructed. Gordon Meijs and the extended wear key account team were awarded the CSIRO Business Excellence Award in 2002. There had been many previous unsuccessful attempts to produce a product lens suitable for long term continuous wear. the lens also needed to be readily manufacturable for large scale production and be biocompatible with the eye and the components of the tear film. a seamless sharing of all experimental findings, so that the groups in Australia, USA and Switzerland could benefit from each other’s research. This was backed up by a dedicated network across all sites and six-monthly face-to-face meetings where all research centres shared and discussed the science. develop protocols for clinical evaluation. Each partner developed a complementary research program in new polymers and in surface treatment of the materials to enhance ocular compatibility. In Australia, those activities were housed at CSIRO and were led by Dr Gordon Meijs (polymer science) and Dr Hans Griesser (surface treatment and analysis). By parallel tracking in the three countries the development of a number of materials and surfaces as well as developing protocols where new materials and surfaces were evaluated in the research centre that best had the capacity and specialist skills, a significant body of knowledge was built up to inform the design of optimum materials and surfaces. In particular, a database of on-eye performance compiled at UNSW fed into and informed the research collaboration. The research was also aided by short-term transfers of personnel ‘ especially to CIBA Vision USA, where potential issues relating to scale up and manufacturing could be understood and jointly solved. A further aid to the research was the presence of representatives from clinical sciences, marketing, manufacture, and from the involvement of intellectual property specialists at the six monthly international review meetings. The research identified the need for discrete phases in the polymer material interwoven in such a way that there was an oxygen transmitting phase and a phase responsible for transmitting ions. These phases had to be produced in such a way that they were not of sufficient size to cause cloudiness or cause the material to have poor mechanical properties, including those responsible for comfort and strength. For effective transmission of oxygen and ions, the phases had to be co-continuous from the anterior to posterior surface of the lens. Research on surface modification techniques defined the best method to modify the surface to promote biocompatibility, including the lack of a propensity to attract deposits from the tear fluid. The surface modification was required to promote good wetting with tears and to assist with comfort. The large body of knowledge amassed within the project about the polymers, surface features and physical properties allowed their codification in a broad family of patent applications that essentially defined the specifications for an effective extended wear lens. In addition, there were numerous individual patent applications directed to individual compositions and methods of manufacture of polymers and surfaces. A further benefit of the project structuring, with parallel approaches on the materials science, was that there was fallback and rapid recovery when a given candidate material failed any of the criteria. Because of this knowledge-base, the lead time for finding potential replacements was low. This was coupled with a strategy to bring candidates as early as possible to manufacture under production-like conditions, to test for any difficulties as soon as possible. After the final polymer and product was selected, named Lotrafilcon A, CSIRO and UNSW provided ongoing support when the lens was in the early stages of manufacture. UNSW provided valuable clinical trialling and in vitro biological evaluation for both improvement and regulatory purposes. CSIRO provided ongoing surface analysis and polymer science troubleshooting. Analyses such as coating thickness and uniformity and means of optimising production of the raw ingredients were carried out. Subsequently, a further variant of Lotrafilcon (Lotrafilcon B) was used to develop an additional product targeted to a slightly different market segment, emphasising improved safe wear for a shorter timeframe to complement the extended wear product. 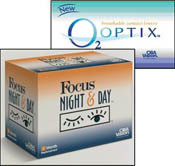 On 11 October 2001, the US Food and Drug Administration approved the Lotrafilcon A lenses for up to 30 night’s continuous wear and there has been significant demand for the product marketed as Focus Night and Day® lenses. The second product, based on a modified Lotrafilcon (Lotrafilcon B) was designed for more flexible applications (daily wear, occasional overnight use), and is marketed as O2OPTIX® lenses. It complements the Lotrofilcon A extended wear product. For their role in nurturing of the relationship between CSIRO, the University of New South Wales and Novartis/CIBA Vision, Gordon Meijs and the extended wear key account team were awarded the CSIRO Business Excellence award in 2002. Meijs GF, 2009, Personal communication.